I think that the title of this post says it all. People of Irish heritage literally have two looks: pinky-white-paleness and, for lack of a better word, lobster-colored—or should I say, lobstah (with a thick Bahston accent). We don’t turn a nice medium brown shade of tan in the sun, like other ethnicities (P included! ), we just cook. It’s not fun. I’ve had my run-ins with the sun before. Two incidents in particular come to mind: in Kenya and on my way to becoming engaged. I’m not anticipating another nasty sun episode, but now that the sun has finally reached New England I’ve realized I have to play it smart (wicked smaht) for the next few weeks—because my wedding gown is strapless, but I always wear sleeves. I never really thought about my arms, neck and face being more pinky-red then my shoulders, chest and back. I might be multi-colored by July 10th! I guess I’ll have to slather on sunscreen. Or wear a hat and light weight long sleeves. Perhaps this will be a good new routine for me. “Hmmm,” I’d ponder out loud, “Mzungus are kind of like chameleons. Our skin likes to change.” (Come to think of it, I probably gave a few small kids mzungu nightmares). Anyway, on my wish list for future potential children– I hope they get his skin, at least they can be spared the Celtic curse of lobsterdom! So there was a funny story from the Marketplace today. I was talking to one of the Cameroonian vendors– their “market stall” was manned by a husband/wife team. The wife was American and had lived in Cameroon for 16 years, and she met her husband there. He used to work in the Cameroonian tourist industry, but came back to the US with his wife two years ago, and now helps some of this artisan friends sell handmade African products in the US. When he found out that I understood French he started switching over to the language he felt most comfortable in, but when his wife would overhear she would say, “No no French… try practicing your English. You are always cheating” The husband’s English was pretty good, having not spoken a word of English before he arrived in the US, he had come a long way. Occasionally he threw in a French word here or there but he was definitely understandable. I said to him, “Don’t worry– my partner, he is from another country too. Do you know the tallest mountain in the world? Mt. Everest? He is from that country.”– the guy looked at me blankly, he had no idea where I was talking about. “Ohhh, Nepal. I have a friend from Nepal. We work together at the Whole Foods in Boston.” He said. Well, that wasn’t what I was expecting. So we both had a hardy laugh. “I guess it goes the other way too… you know the capital of Senegal?” (another French speaking West African country). “People do this much here?” He asked. “Well, not really, it is not considered polite.” she said. And we laughed a little more on the quirkiness of language and culture. The very first African novel I ever read was Things Fall Apart by Nigerian author Chinua Achebe. It was (very thankfully) part of my ninth grade world literature curriculum. It was the first out of three or four times that I would read the novel (so far) in my life, and the first of stacks and stacks of African novels from across the continent that I would eventually read. When the author, Achebe, was a student he read many of the great European classics, and books written about Africa by white Europeans, but he was frustrated to find that there was nothing written from an African perspective. One of his professors challenged him to write, to be the first, and Things Fall Apart was born in 1958. For those of you who have not read the book, the novel is about Okwonkwo, an Igbo villager whose lifespan straddles the time period before the arrival of Europeans to just after their arrival. It is an entire book which describes his life in detail, his exploits as a wrestler and yam farmer, participation in village life, and conflicts of social taboos and Igbo culture. It haunted me because in so many ways it rang true, how little “outsiders” really know about a culture, and how an entire complex book about a man’s life could so easily be brushed off as a passing anecdote in another man’s story. It’s like how we can watch the nightly news and be removed enough from stories about the Pakistani floods to not be moved to tears and horrified by the images. Achebe’s message of “it’s time for us to write our own stories” gives me a bit of an internal struggle. I whole heartedly agree that others shouldn’t be spoken for, I love reading stories in the voices of people who come from that culture and can truly understand its context. But then there is me… a person who is interested in other cultures, who (at least on this blog) writes about a culture that is not my own. I certainly have enough posts that come from my genuine perspective as a person trying to interact with Nepali society, but I also have posts commentating on history and culture where I am removed and the point is to explain more about Nepal in general to an audience who might not be as familiar. I don’t want to speak on behalf of a whole other nation or culture(s), and I certainly welcome people to correct me when I have misinterpreted, misunderstood, or incorrectly wrote something, but I also want to share all of the interesting stories, experiences and insights that I too have learned over the years, and to use writing to prompt me to investigate and learn more for myself. This also comes on the cusp of when I’ve almost grown enough confidence to try and start writing a story whose characters are all Nepali. I wonder out loud if this is kosher? I like to think that I am expanding the “single story” about Nepal for people who are not from there, but are interested to know more. It’s more than just Mt. Everest and Sherpa porters (Can You See Everest From Your House?, “Identity” by Bhuwan Dhungana), more than just colorful festivals and Tibetan prayer flags. And I hope our intercultural life also gives insight to others. So those are my jumbled thoughts early on a Thursday morning. In honor of the good news, I wanted to share P and my engagement story (in two parts). The first part is more of a preface and will give more context to the actual story of the event. Part of this story actually stretches back to the summer before eighth grade (can you believe it?). I was really bored, and spent half my time daydreaming about adventuring off to faraway places that I never thought I would ever get a chance to visit. One day I happened upon the big roadmap/atlas my family had stuffed in the family car and started looking through it and realized there was a list of addresses in the index for national parks across the United States. I decided if I couldn’t go anywhere, I’d try and get other places to come to me (in a way), plus I loved getting mail. I devised a fake summer project for school, and crafted letters to send to national parks across the country asking park rangers to take a picture of what they thought was the most interesting or beautiful place in their park. I must have sent about 25 letters out, and in a few weeks time I started getting things back in the mail. Some parks I never heard back from, but most humored me in some way. I didn’t get any actual photos, but I got a lot of park maps, park newspaper clippings and post cards—many of the postcards I still have to this day! Rocky Mountain National Park, Hawaii Volcano National Park, Glacier National Park, Haleakala National Park, Yellowstone National Park… etc. But one park stood out, because they sent me something unique. 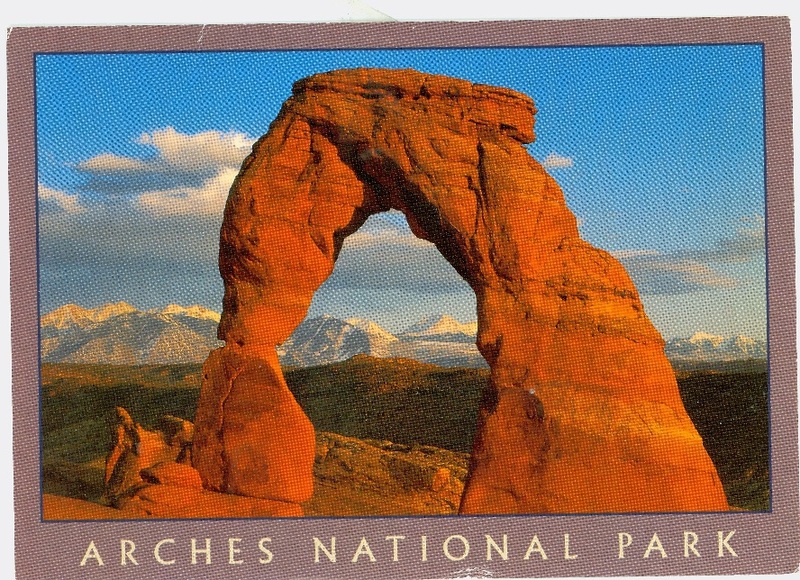 Arches National Park in Utah sent me two postcards… one of the beautiful Delicate Arch and one of Balanced Rock, as well as a commemorative stamp of the Delicate Arch from the park. I was really intrigued by the stamp and the postcards. I’d never seen anything like the towering orange rock… it looked like the surface of Mars to my almost-eighth-grade eyes. Utah might as well have been Mars, it seemed so far away, I never thought I’d actually go there. But I always thought it would be really neat to stand under that arch some day, and I never forgot it. This is a scan of the *actual* postcard I received from Arches in eight grade. A different kind of “delicate”… trust me, this could be a story all on its own, so I will try to keep it short. I’ve discussed before my love of and interest in Africa, but being a mzungu (the Kiswahili word used in East Africa for “white person”), especially a mzungu of Irish ancestry (as Russell Peters joked, “Irish people are the whitest white people on the planet… so white they are practically translucent!”), doesn’t always mix well with the intense African sun. While I was in Kenya I was frustrated by the story of the “delicate mzungu.” Every time I wanted to do something I was told that mzungus were very delicate and I should just sit and watch. Living with rural farmers in Western Kenya I wanted to carry buckets of water on my head, and help harvest the crops, and help wash the dishes and laundry in soapy buckets of water in the backyard as chickens ran around my feet. I wanted to experience rural Kenyan life, but I was met with protests… “No, no, it’s okay. Mzungus are delicate. Please, sit, have some biscuits.” I’d protest… “I’m not delicate! Please let me help! I’m here to learn!” and inevitably I’d either mess up (spill all the water), or something odd would happen (randomly get a nose bleed while washing dishes) and this would seem to reinforce their theory of the delicate mzungu—so sit and have some biscuits. I ran into this “delicate mzungu” theory the whole time I was there, and I kept trying to fight it. I might have been a little more successful, had I been a little smarter. Fast forward to another point during my stay… now I’m living in hot, arid Southern Kenya… a stone’s throw distance from the Tanzanian border, living with the pastoralist Maasai community. I’d been in the field for about a week and a half, living in tents near several family settlements (“bomas”). Our group had run out of all the water we had brought from the city, and had been relying on local bore-hole water boiled over a campfire. It was cloudy with bits of stuff floating in it, and tasted weird. I wasn’t the best at drinking water in general, and had suffered a few bouts of minor dehydration earlier in the semester from not giving myself enough bottles throughout the day. Weird tasting bore-hole water wasn’t helping me in the water drinking department. And for some reason I got it in my head that I could do just fine on far less water than any of my comrades, and over the course of about 4 days I had drank no more than about one Nalgene bottle full of water. Couple this with the dry hot heat and the fact that I hadn’t bathed or even touched water for almost two weeks, I’m sure my body was ready for something to tip it over the edge. Enter stupid delicate mzungu syndrome: The last few days of our field experience we were going to be scattered in various bomas across a wide expanse of land. I was paired with one other student and left with a Maasai family that spoke no English and hardly any Kiswahili to live in their small mud and cow dung huts and sleep on stretched cow hide. We were going to help the family herd their goats and sheep, cook with the family, and help them with their daily routine. However there was a special “age-set graduating ceremony” happening a few miles away, so the family thought it would be fun to take us there. After a night sitting by the fire under the stars in one of the most remote places I’d ever been, singing songs back and forth with my homestay “mother” who was probably younger than me, I awoke the next morning to a cloudy cooler day. I helped with the goats, then had some tea for breakfast, and then got dressed for the age-set graduating ceremony. 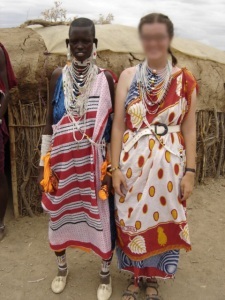 I had asked if I could dress like my hosts in traditional Maasai gear… two strips of cloth tied sarong style, a belt and beads (mistake #1: I’d been wearing light-weight long-sleeved billowy cotton shirts to protect my neck, and arms from sun since I don’t like sunscreen so much and a big floppy hat for protection, now I was very exposed. In addition I still didn’t put on sunscreen—it was cloudy in the morning and I wasn’t thinking, and I had only about half a Nalgene worth of water). I went to the ceremony and my friend and I were the only two mzungus in a sea of about two thousand Maasai so we were quite popular. Little kids stared or cried because they thought there was something wrong with our skin, elders came to meet us, even the chief invited us to his hut as an honor to share a beer (my first ever) with him. I sat in the sweltering mud hut drinking large warm Tuskers with him, my head swimming. Then his son came in—“You honored my father, now honor me… please, have another.” I couldn’t without getting sick, so I settled on a warm bottle of coke. These were only dehydrating me more. After a full day in the now hot bright sun I knew I was burnt to a crisp, and I was starting to feel a bit woozy. I had been very gracious to my hosts, trying to translate for my friend in Swahili, but I wasn’t feeling good, and eventually someone gave me an umbrella and I sat on the ground hiding beneath it until someone decided to take me home (a few miles walk away). I nearly passed out on the walk, but I chalked my bad mood and queasy feeling up to a bad sunburn. And when I say bad, I mean, the worst sunburn of my LIFE. I wouldn’t be exaggerating in the slightest if I said that I literally LITERALLY looked like a lobster. That night I was in so much pain trying to sleep on the cow hide mattress. I could barely stand to wear my clothes. The next morning my professor picked us up and brought us back to camp. As the students slowly filtered back from lots of other settlements people kept asking me if I was okay… and other than a few little bouts of wooziness, and a sore neck and shoulders, I did feel relatively okay. That night our group went out on a night game drive looking for lions, we were all standing on the seats of the Land Rover, our heads popping out the top, excited and singing as the sunset. I felt good, honestly, sunburned but not sick. Until it hit like a freight train all at once. By then it was dark and we were miles and miles from camp. I instantly became incredibly nauseous, incredibly motion sick, and the world was spinning out of control. After trying to deal with it unsuccessfully, and seriously afraid of getting sick all over the car, I asked the professor if we could turn back. That was the longest, hardest car ride of my life. By the time I got back to the camp site I could barely walk straight. As I was helped out of the car I promptly vomited (the first in a long long night of vomiting), each time I got sick, it made me even more dehydrated. I was put on a cot outside in the open air, where my professor thought I’d be more comfortable, and he and a friend tried to force me to drink water laced with packets of rehydration salts. It took me four hours to actually drink one small glass. I was feverish, borderline delirious, and kept getting sick. I literally though I was going to die. I’ve never in my life before felt so utterly terrible. I was terrified of the next morning when the sun came up and it would again be so dry and hot. I was convinced that the heat would kill me. I was genuinely terrified. There was no way for my professor to contact our program compound in Nairobi, we were far beyond cell phone reach, so he had arranged for the camp land rover to take me half way to Nairobi the following morning, calling the other program director in route, and try to meet someone to come pick me up on the side of the road and bring me the rest of the way to the hospital. By morning I’d gotten a few hours of fitful sleep, and had at least one glass of water in my system. My back had broken out in huge sunburn boils, and I struggled to stand up. The professor loaded me in the car, and again I had a sickening drive back to civilization. Nairobi Hospital is the fanciest hospital in the country, once called “The European Hospital” during colonial rule, it was the hospital that our program brought students to when we ran into trouble. Most Kenyans dressed up in beautiful outfits to go to Nairobi Hospital and here I was, dragged in fresh from the bush, filthy, dusty, barely able to walk. They did a few tests, and said they had to draw some blood. Here’s a secret… I’m afraid of needles. It is totally in my head, I understand that, but the thought of getting an injection usually makes me hyperventilate. I rationalized with myself that I didn’t want to be the delicate mzungu freaking out about a routine blood test when there were probably people dying of AIDS in the same hospital, so I took a few deep breaths, and tried to calm my racing heart. I warned the doctors I was a little afraid of needles and braced myself for the prick. It took quite a few rubs of alcohol to get my arm sterile enough. Between embarrassingly apologizing for my filthy appearance, I remember saying to them about the injection, “that wasn’t so bad, I barely felt…” and the next thing I woke up on the floor with nurses staring in my face. “I think you are more than a little afraid” the doctor said, and admitted me to the hospital. Crushed by the theory of the delicate mzungu! How can I argue with that? On my mom’s side of the family, I’m the eldest cousin, but on my dad’s side I’m the third eldest… meaning my two elder female cousins set the tone a little bit on the protocol for marriage. Both of their significant others first asked the permission (privately) of their dad before they proposed. P knew about this, but found it intimidating. My dad is the big silent type. He doesn’t always say much, and can seem daunting to talk to one-on-one. “I don’t really have to do that, do I?” P would ask. “I think you should. It would be nice. Keeping with tradition and all.” I’d say. So hopefully this sets the stage for the second part. Sorry for the length, but hopefully it was interesting. What *Do* You Do Without Toilet Paper? While I was home for the holidays I found three big binders of emails that I used to send to family when I traveled as a college student. I brought the binders back to my apartment in New England and photocopied all the entries, compiling a giant three ring binder with a few hundred pages of travelogue material. I started reading through some of it today, and I am so happy that I found these copies… it is hard to remember exactly how I felt on a given day at a given time, and re-reading my ramblings brought back a lot of memories. I wanted to mention one episode in particular… during my first trip to Africa– to Senegal, the western most country on the continent– as a freshman in college. We were told before we left France for Senegal that we should bring a roll of toilet paper with us because the Senegalese did not generally use it. The class was abuzz… no toilet paper? What do you do if you don’t use toilet paper? I guess it was one of those facts of life that we were left to figure out for ourselves. While I was there, I was completely bewildered by it. Every time I went into the bathroom everything looked wet… the toilet seat, the ground, etc. I couldn’t figure out how everything was getting so wet, nor could I figure out what exactly the local people did to make sure that they were “clean” after using the toilet. After two weeks of living with a family in Dakar, I was still none the wiser, and my personal toilet paper roll had decreased significantly in size. I looked at him blankly. I really had no idea what he was getting at. I still kind of looked at him blankly. I felt like an idiot, his explanation made a lot of logical sense… why did it take me so long to figure out? A few months later P traveled back home for the first time. He told me later that his family teased him a bit and called him “American” because he used toilet paper in the bathroom as a new force of habit. So armed with this new level of bathroom knowledge, a few years later when I traveled to India, I decided to challenge myself and try life without toilet paper. Some of the students I traveled with found it either gross, or weird, or both (while a few others decided to try it themselves as well) I kind of got the hang of it after a while, but I admit that I still felt that toilet paper was easier. My vow of toilet-paper-less-ness was especially challenging after weekend trips on the road when my stomach felt a bit, how shall I say… “disturbed”… and I had to visit the powder room a little more frequently than usual. Not using toilet paper made me feel perpetually damp and moist in my nether regions, serving as a reminder for my running stomach, where as toilet paper wouldn’t have. Today we are a toilet paper household. Its just how it is, there was never really a discussion. I guess P just got used to it in college, and there you go. Every now and then P will complain that the toilet paper chafed his bum a bit, but that is about it. For environmental reasons saying sayonara to toilet paper would be wise, but we haven’t really thought about that. Plus I feel (non-Nepali) family and friends would be just as confused as I first was if they came for a visit and found themselves sans toilet paper. 1) My dad had a good friend in high school who was very smart, had high ambitions, and never really thought about life not going his way. After graduating from college he applied for medical school, and for whatever reason, wasn’t accepted. The friend was devastated. As a result he went on a cross-country road trip that ultimately led to him getting involved with some sort of “religious cult” out in California. He used to send all sorts of weird brainwashed-sounding letters back to my dad, and my dad’s friend’s family was really worried. Eventually they hired a private investigator to go out and bring the friend home—eventually kidnapping him from the supposed cult. However, when the family brought him back to New York, some of the cult members actually kidnapped him back, and it was a bit messy for a while. Eventually though, the friend got away and went on to lead a perfectly normal life (although he never did make it to medical school). Anyway, I’d heard this story growing up and for some reason—maybe because I was interested in things my dad found unusual and didn’t understand—he always worried that I might end up like his friend if I wasn’t careful. Remember this, it’s important. 2) Prior to this story I’d known P about a year and a half. I hadn’t yet visited India or Nepal, and knew very little about Hinduism. Okay, now fast-forward a few years to when I was in college. As I’ve alluded to before, my academic major allowed me to study abroad in France, Kenya and India. While I was in Kenya, P was able to finagle a research grant to join me in East Africa over the winter break to conduct comparative research on the environmental impacts of urbanization on rivers. The year before he had received a research grant to travel home to study the Bagmati River in Kathmandu, and he planned to compare this to the Nairobi River in Kenya as a thesis project. I was elated. I couldn’t wait until P arrived. For years it had been my dream to live and work in Africa, and after spending several months there, I was dying to share this new world with him. Over the Christmas holiday, when I knew Kenya was effectively shut down (at least for anything research or administratively oriented), I planned a whole trip for P and I “up-country” to Kisumu on the shores of Lake Victoria. I had a few friends who had conducted their internship in the city, and they gave me a list of recommended things to see and do, including visiting an orphanage where one of them had worked. I found a small guest house near the orphanage, off the beaten path of the city, down a red dirt road along the water. We arrived by overnight bus (riding through the Rift Valley on the local bus was brutal, the road was completely pockmarked and rutted from the rainy season) and took a local taxi to our guest house. After settling in we decided to check out the neighborhood and find the orphanage. On our walk we ran into some local Kenyan kids with long vertical Vishnu markings on their foreheads and shortly thereafter a passenger van drove by with Hare Krishna information written on the side paneling. “We had a Hare Krishna temple near my high school,” P said when the van passed, “they had a van like that too, and we all used to say that they used the van to kidnap you.” P said this very deadpan, as if he was very serious. I only learned later he was joking. According to a Hare Krishna website the Kisumu Hare Krishna program, "houses children who are abandoned on the streets of Kenya. Here they are given food, shelter and education, and helped to end their glue-sniffing and drug-taking street days." I knew close to nothing about the Hare Krishna movement, in fact, the only thing that I had heard was that some people believe it is a type of cult. I know people make arguments that are both pro-Hare Krishna and anti-Hare Krishna, so I won’t take an official stance, but at the time the cult association was the only exposure to the organization I had known. This knowledge, coupled with P’s sarcastic comment, and the old story of my dad’s friend, had me a bit on edge about the Hare Krishnas. As the week wore on, P and I had a great time. We spent Christmas eve and day volunteering at the orphanage, we went out on an early morning canoe ride in the lake and saw hippos up-close. We met with a friend’s brother in a tiny local (tasty) hole-in-the-wall fish place, and had dinner at his house with his whole family. It was fun. Then the time came to return to Nairobi. We met some of the orphanage kids on the road to say good bye before trying to hitch a ride on a boda boda (bicycle taxi) back to town to catch the bus. The kids were trying to help us haggle but the boda boda drivers wouldn’t budge even though the kids and I knew we were being “grossly overcharged.” We were haggling over about 50 cents, but it was the principal of the thing, and eventually we decided to try our luck and started walking towards town. We were really early for the bus anyway, since we planned to find something to eat before heading out on the long journey back to Nairobi. P, knowing my habit (challenge?) of traveling cheaply, figured this fit the mold… free trip to town, you can’t get more cheap than that… so he opened the van door and climbed in with a big grin on his face. My stomach sank; didn’t these people belong to a cult? What if something happens to us? Yet by this time everyone was looking at me, so I caved and stepped into the van. The driver of the van was Colombian and the two passengers were a married couple, the man was from Bolivia and the woman was a Ugandan of Indian descent whose family was thrown out of the country during the Idi Amin era. The couple explained that they had come to visit East Africa so the woman could “retrace her roots” and show her husband her home country. They were also using the trip as an opportunity to connected with Hare Krishna communities in the area. “We can’t have you travel hungry! Please, join us for breakfast!” the driver said. “Yeah! Sure!” P said, the big grin popping back on his face. I’m sure he thought, more free stuff… alright! The driver turned the van around and started driving out of the city. That’s when my panic level began to rise. I looked at P concerned, but he seemed oblivious, no doubt already thinking about food. On the outskirts of the city the van approached a gated compound. A security guard let the van through, and we parked in the driveway of a large secluded mansion. I heard the front gate slam shut and my heart started racing. This is it! I thought, My dad was right… I’m never going to get out of this… I’m going to be brainwashed by a cult, and lost in Africa forever! I’ll never see my family again! The Colombian driver rang the bell and a Kenyan maid opened the door, dressed in a sari. Although no more unusual than a white American in a sari, I’d never seen an African in a sari before, and it added to the mystic of the compound, and my mounting dread. They are all dressing alike… it must be a cult! The house was decorated with lots of South Asian iconography including large statues and carvings of gods and goddesses. Everything seemed very exotic and different, particularly from the largely Christian Kenyan culture I had been living in for the past several months. In my terrified mind it all added up, this had to be a cult. The driver encouraged us to sit in a parlor area, and the maid was sent to get us some drinks. I frantically looked around the room assessing my surroundings and trying to make sense of it, looking for an escape route, trying to figure out what would be used to brainwash me. A few minutes later, the maid brought in a tray of glasses filled with a thick looking green liquid. When I was handed a glass I quickly took a whiff, trying to detect if it was safe to drink. I was told it was some sort of wheat germ smoothie. Was this going to drug me? I watched as the others were served and the driver took a large gulp. P had a sip and he looked fine. I decided to just hold it and pretend to drink. The driver and couple asked us many questions. What were we doing in Kenya? How long were we staying? What brought us to Kisumu? They continued to take an interest in P, especially when he talked about his research. I started making excuses about time, and catching the bus, but they courteously brushed aside my concerns. Suddenly a conch shell horn sounded in another room and the the couple quickly stood up and walked towards the sound while the driver paused to invite us to worship with them. Aha! This is how they will do it! They’ll brainwash us while “worshiping.” Now I’m done for! I wanted to grab P and run, but he didn’t seem concerned at all. Dumbly, I followed and we turned a corner into a large room made up like a temple with two life-sized Krishna and Radha statues. The entire wall was meticulously decorated in fabric and flowers, and the statues sat on large wall-length altars. The gods were elaborately dressed in shiny clothes and garlanded with fresh flowers. I’d never in my life (up to that point) seen anything like it. Already scared out of my mind, I thought for sure that this legitimized my fear. Had I been to India before this story took place, or visited a temple with P–even an American Hindu temple–or if I knew more about Hinduism at the time, I’m sure I would not have found the room so threatening. Yet all I could think of was my dad’s cult prediction. The driver explained that Hare Krishnas worshiped through music and handed each of us a small musical instrument. I received a pair of wood blocks and P was given finger cymbals. At this point I was shooting death glares at P, who seemed totally unaffected by the situation. The music started and he bobbed his head back and forth to the music, ting-tinging the little cymbals to the beat, happy as a clam. How can he be so oblivious?? My mind screamed, trying to telepathically send him messages, P we need to get out of here NOW and save ourselves!!! Then the caretaker of the house, an Indian woman dressed in a starched cotton sari, entered the room with a shiny metallic platter carrying incense, a candle and other items for the aarti. During the music and chanting, she stood in front of the statues with the platter, rotating it in circles in front of the gods. I was feeling queasy with fear and internally freaking out. I wasn’t sure what was going to brainwash me, but I was absolutely… absolutely… sure that it was going to happen. Would it be the music? The exotic smelling incense? The rhythmic chanting? Would I ever see the light of day again??? The music seemingly continued on forever. I kept making exaggerated gestures to check my watch to show how impatient I was to catch the bus while also trying to catch P’s attention, and hum something in my head to counteract the alleged brainwashing. Its hard to think of another time that I had ever been so scared. Yet finally the music stopped, and miraculously I still had control over my own mind. I can’t help but admit that I was both very surprised, and extremely relieved. The driver asked if we enjoyed the worship and I began reiterating the fact that we had tickets for the bus and had to get going. “But we can’t let you leave without breakfast! !” the driver insisted. “No, trust me, we are fine. We really need to go. I’m not even hungry… P, are you hungry?” I said, hoping he would get the hint. “Actually, I am still kind of hungry.” P said. The Indian caretaker led us to her dining room, which had been laid out with a full Gujarati meal for breakfast. The driver insisted we sit. I sat down and started shoveling food into my mouth at a tremendous speed, insisting over and over, in-between bites and gulps for air, that we had to go, we had to make the bus, we were already late. I was hoping the more I insisted, and the faster I ate, the quicker we could get out of there. Meanwhile, P was savoring the food. He looked utterly satisfied, “I haven’t eaten some of this stuff in years! Delicious!” he kept repeating, taking a second helping, and cleaning his plate. “Please, we have to go!” I continued to beg. “You can’t go without snacks for your journey” the Indian caretaker said, and asked the maid to go in the kitchen and pack some food. “No really, its fine.” I pleaded. “Its no trouble” the woman insisted. Finally, FINALLY, the maid entered with our packed food, and the Colombian driver stood up to take us out the door. P thanked everyone and happily followed the driver, while I grumbled a quick thanks and scurried after them. It’s hard to describe the relief I felt to walk through the front door, and feel the warm African sun on my face. To breathe in the earthy air of the garden, and to hear the birds chirping in the trees. When I went in that house, I never expected to exit, not like this. Me: “Because I have been scared out of my mind for the last hour and a half!” and I explained my dad’s cult story. So, the moral of the story is: my first interaction with a form of Hinduism thoroughly freaked me out. However, I’ve learned so much since then, and I think I would have handled the situation a lot better if it had happened today. Looking back, everyone was actually very nice, and I now find the story amusing and the situation comical since I know it has a happy ending. Meanwhile… try to communicate with your partner better than just shooting him “death glares” from across the room… because maybe they can help explain the situation if they actually know what you are thinking. And lastly, never listen to cult stories from your dad as a kid. It will scar you for life.